Only 9 more states to go! Number 9 is Oregon, and for our Oregon meal, we chose dungeness crabs. Hubby and I both remarked that this was probably the least exciting of our 50 states meal (with the exception of Utah—jello is pretty boring). It wasn’t because the meal didn’t taste good or anything like that. The meal was really straightforward, with no screw ups in the kitchen at all. It wasn’t even difficult to get the dungeness crabs, even though they’re not local. In fact, the dungeness crabs were actually on sale at our grocery store the same week we were planning on having them. Seriously…it was so simple. Throw dungeness crabs in steam pot. Throw corn and potatoes in pot. Add Old Bay. (My family is addicted to Old Bay. They put it on everything, including bagels.) Steam them for a half hour. Eat crabs. The crabs are messy to eat, of course—what crabs aren’t messy? Dungeness crabs can be found in the Pacific ocean, and are popular in Oregon and Washington State. They are actually named after the Dungeness Spit, an area in Northwest Washington State. These crabs are pretty large (at least the ones we got were) and full of meat. They are definitely not my favorite crab, though. They were good, don’t get me wrong. 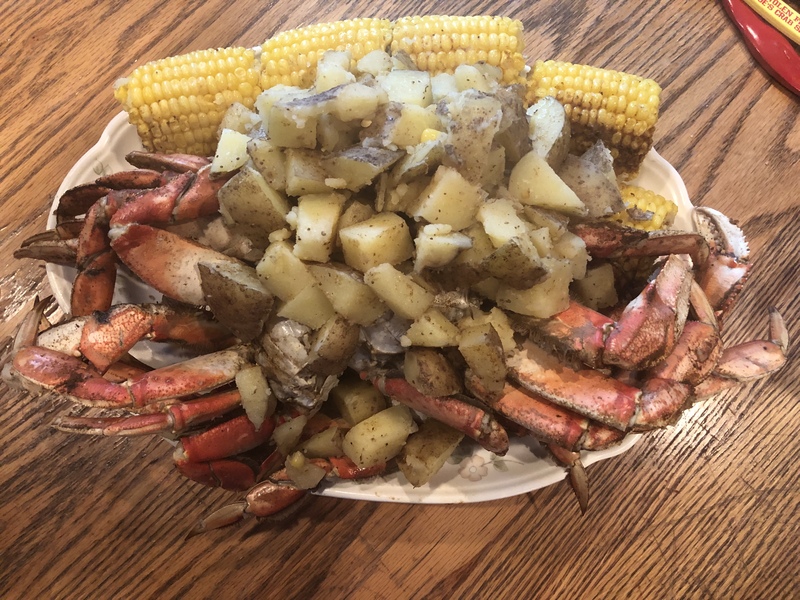 But I find Dungeness crabs to be a little drier and not as juicy as I am accustomed to with my favorite crabs, King Crabs. Who Doesn’t Love King Crabs? I’m sure there is someone out there that isn’t a King Crab fan, but he or she doesn’t live in my household. In fact, when we did Alaska, we were fighting over the crab legs. They’re crazy expensive, though, and oh, so prickly, making it difficult to eat. But my goodness they are by far the tastiest (in my opinion). Snow crab is like the smaller cousin of Alaskan King Crab. It is found in the coastal waters of Maine and Alaska. They are sold in clusters, and often what people associate eating crab with (at least around here). You crack them open and pull the meat out. Dip in butter. Yum. I think I never even had a different type of crab until we went to Maryland and they piled crab (with eyeballs) in front of us and handed us a mallet. Yup, Blue Crab. On the east coast, we’ve got blue crab. It’s so popular around here that it’s on Maryland license plates. Blue crabs are sweet—you eat the body rather than the legs (although the claw meat is eaten). In Ocean City, there are crab joints on every corner (our favorite is Higgins Crab House North). People catch their own crab with crab pots and nets all the time. Soft shell crab is also a delicacy on the East Coast—it’s Blue Crab that has molted. Down in the lower part of the Atlantic, from the Carolinas to the Gulf Coast, there are Stone Crab, which I have never had. Apparently, you only eat the claws, so crabbers will catch them, remove one claw, and set them free to regenerate that claw. That sounds so cool…recycling your food! 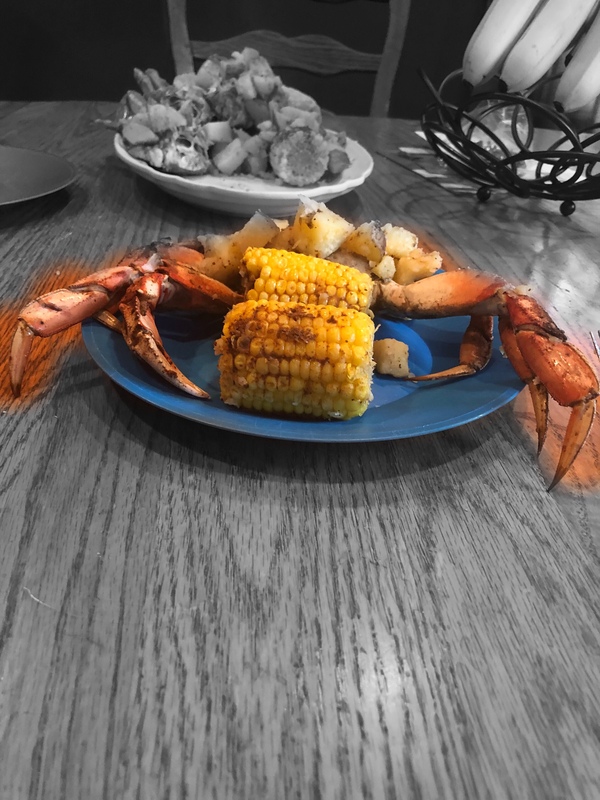 Anyway, the Oregon meal was good…surprisingly filling for crab (usually we end up starving an hour after we eat crab). 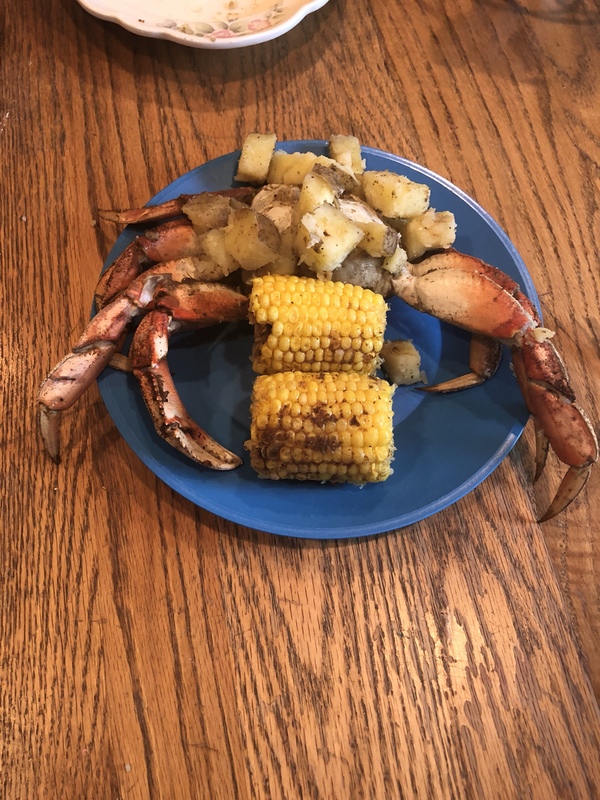 So if you are a crab fan and you’ve never tried Dungeness crab, give it a shot. You might have a new favorite.